Hermann Karl Hesse was born on 2 July 1877 in the Black Forest town of Calw in Württemberg, German Empire. His grandparents served in India at a mission under the auspices of the Basel Mission, a Protestant Christian missionary society. Hesse's mother, Marie Gundert, was born at such a mission in India in 1842. In describing her own childhood, she said, "A happy child I was not..." As was usual among missionaries at the time, she was left behind in Europe at the age of four when her parents returned to India. Hesse grew up in a Swabian Pietist household, with the Pietist tendency to insulate believers into small, deeply thoughtful groups. Furthermore, Hesse described his father's Baltic German heritage as "an important and potent fact" of his developing identity. His father, Hesse stated, "always seemed like a very polite, very foreign, lonely, little-understood guest." His father's tales from Estonia instilled a contrasting sense of religion in young Hermann. "[It was] an exceedingly cheerful, and, for all its Christianity, a merry world... We wished for nothing so longingly as to be allowed to see this Estonia ... where life was so paradisiacal, so colorful and happy." Hermann Hesse's sense of estrangement from the Swabian petty bourgeoisie further grew through his relationship with his maternal grandmother Julie Gundert, née Dubois, whose French-Swiss heritage kept her from ever quite fitting in among that milieu. Hesse showed signs of serious depression as early as his first year at school. In his juvenilia collection Gerbersau, Hesse vividly describes experiences and anecdotes from his childhood and youth in Calw: the atmosphere and adventures by the river, the bridge, the chapel, the houses leaning closely together, hidden nooks and crannies, as well as the inhabitants with their admirable qualities, their oddities, and their idiosyncrasies. The fictional town of Gerbersau is pseudonymous for Calw, imitating the real name of the nearby town of Hirsau. It is derived from the German words gerber, meaning "tanner," and aue, meaning "meadow." Calw had a centuries-old leather-working industry, and during Hesse's childhood the tanneries' influence on the town was still very much in evidence. 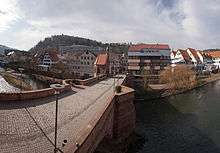 Hesse's favorite place in Calw was the St. Nicholas-Bridge (Nikolausbrücke), which is why the Hesse monument was built there in 2002. On 17 October 1895, Hesse began working in the bookshop in Tübingen, which had a specialized collection in theology, philology, and law. Hesse's tasks consisted of organizing, packing, and archiving the books. After the end of each twelve-hour workday, Hesse pursued his own work, and he spent his long, idle Sundays with books rather than friends. Hesse studied theological writings and later Goethe, Lessing, Schiller, and Greek mythology. He also began reading Nietzsche in 1895, and that philosopher's ideas of "dual...impulses of passion and order" in humankind was a heavy influence on most of his novels. In 1901, Hesse undertook to fulfill a long-held dream and travelled for the first time to Italy. In the same year, Hesse changed jobs and began working at the antiquarium Wattenwyl in Basel. Hesse had more opportunities to release poems and small literary texts to journals. These publications now provided honorariums. 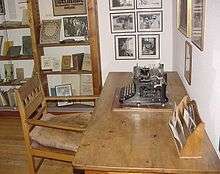 His new bookstore agreed to publish his next work, Posthumous Writings and Poems of Hermann Lauscher. In 1902, his mother died after a long and painful illness. He could not bring himself to attend her funeral, afraid that it would worsen his depression. With the literary fame, Hesse married Maria Bernoulli (of the famous family of mathematicians) in 1904, settled down with her in Gaienhofen on Lake Constance, and began a family, eventually having three sons. In Gaienhofen, he wrote his second novel, Beneath the Wheel, which was published in 1906. In the following time, he composed primarily short stories and poems. His story "The Wolf," written in 1906–07, was "quite possibly" a foreshadowing of Steppenwolf. By the time Hesse returned to civilian life in 1919, his marriage had shattered. His wife had a severe episode of psychosis, but, even after her recovery, Hesse saw no possible future with her. Their home in Bern was divided, their children were accommodated in pensions and by relatives, and Hesse resettled alone in the middle of April in Ticino. He occupied a small farm house near Minusio (close to Locarno), living from 25 April to 11 May in Sorengo. On 11 May, he moved to the town Montagnola and rented four small rooms in a castle-like building, the Casa Camuzzi. Here, he explored his writing projects further; he began to paint, an activity reflected in his next major story, "Klingsor's Last Summer", published in 1920. This new beginning in different surroundings brought him happiness, and Hesse later called his first year in Ticino the fullest, most prolific, most industrious and most passionate time of my life. In 1922, Hesse's novella Siddhartha appeared, which showed the love for Indian culture and Buddhist philosophy that had already developed earlier in his life. In 1924, Hesse married the singer Ruth Wenger, the daughter of the Swiss writer Lisa Wenger and aunt of Méret Oppenheim. This marriage never attained any stability, however. "You should let yourself be carried away, like the clouds in the sky. You shouldn’t resist. God exists in your destiny just as much as he does in these mountains and in that lake. It is very difficult to understand this, because man is moving further and further away from Nature, and also from himself." Hesse observed the rise to power of Nazism in Germany with concern. In 1933, Bertolt Brecht and Thomas Mann made their travels into exile, each aided by Hesse. In this way, Hesse attempted to work against Hitler's suppression of art and literature that protested Nazi ideology. Hesse's third wife was Jewish, and he had publicly expressed his opposition to anti-Semitism long before then. Hesse was criticized for not condemning the Nazi party, but his failure to criticize or support any political idea stemmed from his "politics of detachment [...] At no time did he openly condemn (the Nazis), although his detestation of their politics is beyond question." From the end of the 1930s, German journals stopped publishing Hesse's work, and the Nazis eventually banned it. In his time, Hesse was a popular and influential author in the German-speaking world; worldwide fame only came later. Hesse's first great novel, Peter Camenzind, was received enthusiastically by young Germans desiring a different and more "natural" way of life at the time of great economic and technological progress in the country (see also Wandervogel movement). Demian had a strong and enduring influence on the generation of home-returners from the First World War. ; similarly, The Glass Bead Game, with its disciplined intellectual world of Castalia and the powers of mediation and humanity, captivated Germans' longing for a new order amid the chaos of a broken nation following the loss in the Second World War. By the time of Hesse's death in 1962, his works were still relatively little-read in the United States, despite his status as a Nobel laureate. A memorial published in the New York Times went so far as to claim that Hesse's works were largely "inaccessible" for American readers. The situation changed in the mid-1960s, when Hesse's works suddenly became bestsellers in the United States. 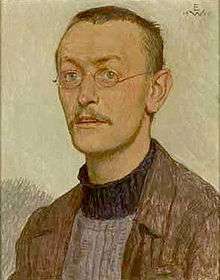 The revival in popularity of Hesse's works has been credited to their association with some of the popular themes of the 1960s counterculture (or hippie) movement. In particular, the quest-for-enlightenment theme of Siddhartha, Journey to the East, and Narcissus and Goldmund resonated with those espousing counter-cultural ideals. The "magic theatre" sequences in Steppenwolf were interpreted by some as drug-induced psychedelia, although there is no evidence that Hesse ever took psychedelic drugs or recommended their use. To a large part, the Hesse boom in the United States can be traced back to enthusiastic writings by two influential counter-culture figures: Colin Wilson and Timothy Leary. From the United States, the Hesse renaissance spread to other parts of the world, and even back to Germany: more than 800,000 copies were sold in the German-speaking world in 1972–1973. 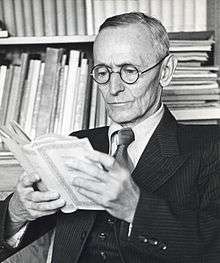 In a space of just a few years, Hesse became the most widely read and translated European author of the 20th century. Hesse was especially popular among young readers, a tendency which continues today. Hesse's Siddhartha is one of the most popular Western novels set in India. An authorized translation of Siddhartha was published in the Malayalam language in 1990, the language that surrounded Hesse's grandfather, Hermann Gundert, for most of his life. 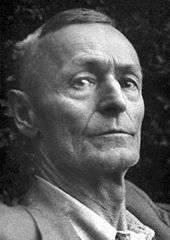 A Hermann Hesse Society of India has also been formed. It aims to bring out authentic translations of Siddhartha in all Indian languages and has already prepared the Sanskrit, Malaylam and Hindi  translations of Siddhartha. One enduring monument to Hesse's lasting popularity in the United States is the Magic Theatre in San Francisco. Referring to "The Magic Theatre for Madmen Only" in Steppenwolf (a kind of spiritual and somewhat nightmarish cabaret attended by some of the characters, including Harry Haller), the Magic Theatre was founded in 1967 to perform works by new playwrights. Founded by John Lion, the Magic Theatre has fulfilled that mission for many years, including the world premieres of many plays by Sam Shepard. Throughout Germany, many schools are named after him. In 1964, the Calwer Hermann-Hesse-Preis was founded, which is awarded every two years, alternately to a German-language literary journal or to the translator of Hesse's work to a foreign language. There is also a Hermann Hesse prize associated with the city of Karlsruhe. (1919) Strange News from Another Star. 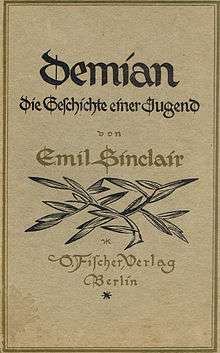 (Originally published as Märchen) Collection of short stories written between 1913 and 1918. ↑ German Wikipedia, other sources. ↑ Gundert, Adele, "Marie Hesse: Ein Lebensbild in Briefen und Tagebuchern," as quoted in Freedman (1978) pp. 18–19. 1 2 3 Hermann Hesse: Briefe. Frankfurt am Main: Verlag Suhrkamp, 1964. p. 414. ↑ Volker Michels (ed. ): Über Hermann Hesse. Verlag Suhrkamp, Frankfurt am Main, vol 1: 1904–1962, Repräsentative Textsammlung zu Lebzeiten Hesses. 2nd ed., 1979, ISBN 3-518-06831-8, p. 400. ↑ An English equivalent would be "Tannersmead." ↑ Freedman (1978) p. 117. ↑ Gustav Emil Müller, Philosophy of Literature, Ayer Publishing, 1976. ↑ "Hermann Hesse Schriftsteller" (in German). Deutsches Historisches Museum. Retrieved 15 January 2008. 1 2 Mileck, Joseph (1977). Hermann Hesse: Biography and Bibliography. Vol.1. Berkeley, Los Angeles, London: University of California Press. p. 42. ISBN 0-520-02756-6. Retrieved 11 October 2010. ↑ Freedman (1978) pp. 170–71. ↑ The original is found in Hesse, Hermann. 1951. Gesammelte Werke. Suhrkamp Verlag. p. 378: "Von ihnen bin ich erzogen, von ihnen habe ich die Bibel und Lehre vererbt bekommen, Ihr nicht gepredigtes, sondern gelebtes Christentum ist unter den Mächten, die mich erzogen und geformt haben, die stärkste gewesen. (A more literal translation is offered: "Not the preached, but the practiced Christianity, among the powers that shaped and molded me, has been the strongest"). ↑ Galbreath (1974) Robert. "Hermann Hesse and the Politics of Detachment", p. 63, Political Theory, vol. 2, No 1 (Feb 1974). ↑ Hermann-Hesse-Preis award. Hermann-hesse.de (2012-09-18). Retrieved on 2012-09-23. Prinz, Alois, Und jedem Anfang wohnt ein Zauber inne. Die Lebensgeschichte des Hermann Hesse, Suhrkamp Verlag, Frankfurt am Main, 2006. ISBN 9783518457429.